It’s just three short weeks away. ASA’s annual National Medical Cannabis Unity Conference kicks off three informative, action-packed days for medical cannabis advocates with a welcome reception the evening of Tuesday, May 22, at the Omni Shoreham Hotel in Washington, D.C. The next day, Wednesday, May 23, is devoted to federal policy and lobbying efforts, with a briefing on the “Opioid Crisis and Federal Policy,” followed by a workshop on the “ABC’s of Citizen Lobbying” before heading by chartered busses to Capitol Hill. After a noon press conference at the Capitol on why medical cannabis should be part of federal policy solutions, advocates will fan out to the offices of their elected representatives to meet with lawmakers and staffers. Later that evening at the annual awards dinner, ASA will honor notable 2017 achievements by advocates, doctors, lawmakers, journalists and other stakeholders, including Patient Advocate of the Year, Jennifer Collins of Virginia, whose story you can read in the activist profile of this newsletter. Other honorees are Elected Official of the Year, West Virginia State Senator Richard Ojeda; Chapter, Affiliate, or Action Group of the Year, Together for Responsible Use and Cannabis Education (TRUCE); Researcher of the Year, Ryan Vandrey, PhD; Medical Professional of the Year, Carlo Tornatore, MD; and Journalist of the Year, David Hodes. ASA’s Courage Award goes to the Zartler Family of Richardson, Texas, and the End Pain Not Lives Champion of the Year is the US Pain Foundation. After a breakfast and opening remarks on the main day of the conference, Thursday, May 24, conference attendees will have the chance to hear from leading experts on a host of topics related to state and international developments. First up is “Intervention: How Government Can Save Lives” which details how some government officials are working to break down barriers to opioid alternatives and creating the safety protocols we need to end the epidemic that is claiming more than 100 American lives each day. Moderated by ASA Legislative Counsel David Mangone, the panel features New York State Assembly member Daniel O'Donnell. The second session is “Preventing Poison: Consumers’ Role in Quality Assurance,” moderated by Jahan Marcu, PhD, ASA’s Chief Scientific Officer as well as Director and Chief Auditor for the PFC program. Panelists Ezra Pryor, Past Chair of the Cannabis Chemistry Subdivision (CANN) of the American Chemical Society; Trish Flaster, Executive Director, Botanical Liaisons; and Jeff Raber, PhD, founder of The Werc Shop, an analytic laboratory, will address the disparity between medical-grade cannabis and lower quality alternatives and regulatory standards for product purity and safety. Following lunch, ASA Associate Director Debbie Churgai will moderate “Connect Four: Educating Patients, Physicians, Providers, and Policy Makers.” Leading experts from various stakeholder groups will discuss what they are doing to make sure people know the truth about medical cannabis. Panelists include Meredith Fisher-Corn MD, editor-in-chief of TheAnswerPage.com, one of the leading online medical education resources; Deb Kimless MD, the medical director of ForwardGro, one of Maryland’s premier growers of medical cannabis; Sarah Laucks, the director of education and events for Abilities Expo, which produces shows in New York and Los Angeles for the community of people with disabilities; and Debby Miran, a former commissioner of the Maryland Medical Cannabis Commission. The midafternoon panel, moderated by ASA Executive Director Steph Sherer, will focus on the global response to treating pain with medical cannabis. Panelists from the International Cannabis and Cannabinoids Institute (ICCI) in the Czech Republic include CEO Pavel Kubů; Tomas Sadilek, ICCI director of government affairs; and Ethan Russo MD, one of the world’s leading ethnobotanists and ICCI’s director of medical research. The last panel of the day, “People over Process: Making Lives a Priority in Public Policy,” assembles five advocates who have had success as citizen lobbyists to share how to be effective in your community. 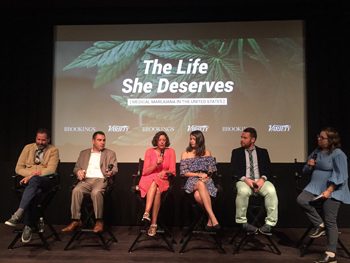 Moderated by ASA California Director Don Duncan, panelists include Christine Stenquist of Utah, who is president of Together for Responsible Use and Cannabis Education (TRUCE); Julie Prom, the director and veterans outreach coordinator for Illinois Women in Cannabis; Ellen Lenox Smith of Rhode Island, who is co-director of the U.S. Pain Foundation; and Diana Dodson of California, who has participated in clinical cannabis trials and advocated in the media. ASA’s 2018 National Unity Conference closes on Thursday evening, but many conference attendees will join ASA the following day for a special Patient Focused Certification (PFC) training on handling federal law enforcement encounters. The raid preparedness training will teach participants how to be prepared for Law Enforcement interactions of all kinds. This training is suggested for patients, providers and anyone working in the medical cannabis industry. The PFC federal raid training is open to those who attend the conference and for those who just want to attend the training. Check out http://www.nationalmedicalcannabisunityconference.org/website for updates to the agenda and speakers. The Unity conference is a chance for you to meet with other patients, advocates, medical professionals, scientists, regulators and politicians for focused discussions of medical cannabis. Early registration rates are ending soon. Please also book your hotel as soon as possible, as hotel rates will double in price when the conference room block is full!. ASA is proud to announce new sponsors for the National Unity Medical Cannabis Conference, Diamond Level Sponsor, Bluebird Botanicals. Bluebird Botanicals specializes in manufacturing and distribution of Hemp Extract supplements, cannabidiol (CBD), CBD vape oil, and more. Additional sponsors include California Normal, Humboldt Farms and 3C Consulting. Over the past six years, with the help of our Sponsors, ASA has brought over a thousand medical cannabis patients to DC to improve their advocacy skills and meet with their Senate and House representatives about federal legislation. If you would like to help sponsor the conference and bring medical cannabis patients to DC, please contact conference@safeaccessnow.org or visit http://www.nationalmedicalcannabisunityconference.org/sponsor_unity. Last month, in response to a request from the Food and Drug Administration (FDA), ASA submitted comments on behalf of patients on the efficacy of cannabis as a medical treatment for many conditions. In early April, the FDA posted a notice in the federal register asking about cannabis and its derivatives because the World Health Organization (WHO) is considering reclassifying cannabis and cannabis products such as cannabidiol (CBD). WHO recommendations can affect how cannabis and its products are classified by the United Nations and international treaties. The most important of those treaties for patients, the Single Convention on Narcotic Drugs of 1961, classifies cannabis as a Schedule IV drug, which has the characteristics of being liable to abuse and producing ill effects which are not set off by substantial therapeutic advantages. This is analogous in US law to the Controlled Substances Act’s Schedule I classification. ASA’s recommendations to the FDA focus on the fact that much has been discovered about cannabis since the decision-making process that originally scheduled cannabis under United Nations protocol. In the nearly 60 years since then, there have been thousands of research studies on the medical efficacy and safety of cannabis, including studies from the National Academies of Sciences, Engineering and Medicine, The British Parliament, and International Cannabis and Cannabinoid Institute. The FDA’s call for comments in response to the WHO marks an expansion on the WHO’s previous request, which was restricted to cannabidiol only. Last month, the states of Pennsylvania, Indiana and Utah each expanded safe access within their medical cannabis programs. In Pennsylvania, the health secretary accepted the recommendation of the state's medical marijuana advisory board to broaden the qualifying conditions and to allow access to cannabis flower, not just extracts. The new conditions are opioid dependency, neurodegenerative diseases and spastic movement disorders, as well as cancer remission therapy. The new regulations require patients to vaporize herbal cannabis products. In Indiana, Gov. Eric Holcomb (R) signed Senate Bill 52, which allows the sale of "low THC hemp extract" products with no more than 0.3 percent THC. The new law requires that any extracts be derived from plants that meet the definition of industrial hemp. This supplements the law passed in 2017 that permits the use of CBD products with treatment-resistant epilepsy but provided for no regulated manufacture or distribution of the products, leading to dozens of law enforcement raids on CBD retailers in the state. In Utah, Gov. Gary Herbert (R) signed into law a trio of bills to expand research and safe access under the state’s 2014 legislation that allows patients with intractable epilepsy to possess CBD-infused products but made no allowance for manufacturing or distributing them. Under HB 195, all terminal patients with no more than six months of life expectancy will get access to CBD oils and extracts through state-licensed providers. Manufacture of those cannabis products will be contracted by the state Department of Agriculture and Food under HB 197, and are required to be available by January 2019. The third measure, SB 130, establishes licensed cultivation of industrial hemp for the purpose of manufacturing CBD products with a 10 to 1 CBD:THC ratio. Voters in Oklahoma will decide a medical cannabis initiative in June, with patients in Utah hoping for the same chance in November. Oklahoma State Question 788, if enacted, would establish a robust medical cannabis program that would allow registered patients -- who can qualify on the basis of any condition their doctor says might be helped by cannabis -- to possess up to three ounces on their person and eight ounces at home, as well as cultivate six mature plants and six immature ones. The measure would establish commercial licensing for cultivation, manufacturing and distribution. Municipalities would be allowed to establish zoning rules for dispensaries but not prevent them from operating. The state would collect a 7 percent tax on cannabis sales. Patient advocates in Utah have submitted signatures for a medical cannabis initiative to appear on the November ballot. If certified by the secretary of state, voters there will have a chance to enact a medical cannabis program that would license cultivation and dispensary operations to serve qualifying patients. Available products will be restricted to edible and topical forms and low-THC, high-CBD oils that can be vaporized. If passed, the measure mandates patient registry cards will be issued no later than March 1, 2o20, and municipalities would be prohibited from banning state-licensed medical cannabis operations. By 2021, any patient that does not have a dispensary within 100 miles would be allowed to cultivate up to six cannabis plants. Medical cannabis products would be exempt from sales tax in Utah. If approved for the ballot, it will be decided in the November general election. Jennifer Collins of Virginia may be the youngest recipient of ASA’s annual Patient Advocate of the Year Award, but at 18 she has already been an effective advocate for years. The culmination of that advocacy came in February with the unanimous passage by both houses of the Virginia legislature of a broad expansion of the commonwealth’s medical cannabis program from only intractable epilepsy to any condition for which a physician recommends it. The journey that brought Jennifer to that moment in the state capitol this February has been long and frightening and even involved leaving home and splitting up her family. Diagnosed with epilepsy at age eight after an EEG revealed that the daily episodes of eye-fluttering and loss of hearing were “absence” or petit mal seizures, Jennifer did not initially need medication of any kind. Her doctor did not see signs of any brain damage from the seizures, and her parents were loath to risk the side effects, in any case. But within three years, the first grand mal seizure occurred, and Jennifer started taking Depakote, a first-line seizure medication. That medication controlled the seizures, but at a very high price. Within six months of starting it, Jennifer had become violently aggressive, attacking her mother and other family members. All the doorknobs had to be removed from the house to keep her safe. Worse, Jennifer finally confided that she was suicidal and planning her death. She was 11 years old. As soon as the Depakote was withdrawn, the serious seizures returned, so they tried combining it with antidepressants, then a cocktail of medications. In addition to the emotional problems the pharmaceutical medications caused, Jennifer was also experiencing cognitive decline. Once a top student, she was now in a self-contained classroom with an Individualized Educational Plan. Jennifer’s mother, Beth, began desperately researching alternatives and soon learned about cannabis and CBD extracts. At first, Jennifer’s parents were skeptical, but her neurologist was blunt. He had nothing more to offer, and if it was his daughter, he’d try it. It was 2013, two years before their home state of Virginia would allow any cannabis product for any condition, so the Collins family was faced with a wrenching decision: break the law to access products of unknown consistency and quality on the underground market where they lived or move somewhere that Jennifer could legally obtain the medicine that might help her. With an established, comfortable life in Virginia and no certainty about whether it would help, the Collins family decided to split up. Jennifer and her mother would move to Colorado Springs, while her father and sister remained. At 13, Jennifer started a new school and a CBD extract. To the horror of everyone, the CBD made her seizures worse. After purging it from her system and getting a new baseline EEG, Jennifer started an extract of THCA, the non-psychoactive precursor of delta9-THC. The THCA worked wonders, immediately reducing her seizures by 90 percent. She has not had a grand mal episode since. Jennifer and her mother had found a community of medical cannabis refugees in Colorado, but the separation from family and friends weighed heavily. As she started high school in Colorado Springs the next year, Jennifer penned a letter to Virginia lawmakers, pleading that she be allowed to come home with the only medicine that was proving safe and effective. Later that year, they returned to Virginia, and Jennifer began testifying at state hearings on the first medical cannabis legislation, which was passed in 2015. Many lawmakers said afterward that it was her testimony that had overcome their opposition. That was also the year that Jennifer and her family attended ASA’s national unity conference and met John Hudak of the Brookings Institution, who interviewed them for his 2016 essay, “The Medical Marijuana Mess.” That led to a visit from director George Burroughs and a film crew for a short video to accompany the essay. A year later, Brookings approached the family about doing a short documentary on Jennifer, The Life She Deserves, that premiered April 18 in Los Angeles with Jennifer and her mother in attendance (pictured at left). “It’s not really a decision,” she says. Jennifer will receive ASA’s Patient Advocate of the Year Award at a reception and dinner at the Omni Shoreham Hotel, May 24, during the National Unity Conference. Studies show that citizen lobbying is the most effective way to convince law makers to take action. That’s why ASA hosts a National Lobbying Day as part of the annual Unity Conference. Join us this year, either in Washington, D.C. or remote from home as we urge Congress to take bold action to protect patients across the nation. If you register with ASA for the Capitol Hill event, we’ll make appointments for you with your elected representatives, but you don’t have to be part of the conference to participate. If you can’t be in D.C., join us by making calls to your Senators and Representative in support of the CARERS bill and other national legislation. http://www.safeaccessnow.org/carers2017.